„As I spent time in Poland I came to realise what a great power that was in Karol Wojtyła’s prayers and his words that had truly „renewed the face of the earth”. It’s all strongly related to my acting career and personal life.” An interview with Jim Caviezel, an actor best known for playing Jesus in Mel Gibson’s „The Passion of the Christ”, was carried out by Łukasz Adamski. Lukasz Adamski: You became the narrator of a documentary about Karol Wojtyła called „Liberating the Continent: John Paul II and the Fall of Communism”. While being in Poland at the invitation of the Knights of Columbus you have visited the area where he lived and worked. Who Karol Wojtyła is to you in a personal, and not only geopolitical sense? 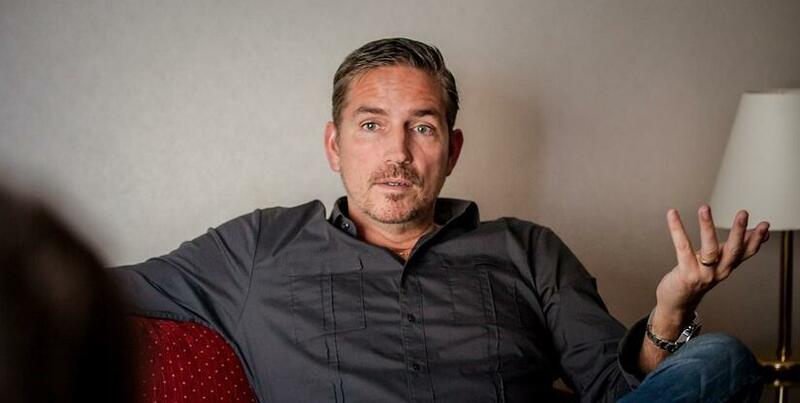 Jim Caviezel: During my visit to Poland I came to understand that he was carrying problems of the entire world on his shoulders. Not until now have I realised what a great power that was in Karol Wojtyła’s prayers and his words that had truly „renewed the face of the earth”. Except for this, there is a more personal side to it. Playing Jesus himself I faced a lot of criticism and often derision. I had to get on with it somehow and there wouldn’t be Jim Caviezel as Jesus if it wasn’t’ for John Paul II. Looking at his life and the power of his evangelism, I said to myself: why would you even care about that nonsense? As a young person I read a lot about Nazism and the genocide carried out by Germans on Polish territory. The only source of my knowledge was limited to books but during my stay in Poland I realised how much Wojtyła must have suffered being directly exposed to Nazism. I’ve been to Auschwitz where Maksymilian Kolbe martyrly gave his life for a fellow prisoner. It made me realise the scale of suffering of Polish people. And then the Communism had followed making John Paul II to live under two of the most monstrous regimes. As American I lived peacefully worrying about the Cold War at most. I did not experience the totalitarian power. John Paul II had to live under two of them, just like your entire country. He represents it. Poland, just like the Christ, had been crucified. Virgin Mary is the mother of Poland. Before he died, Wojtyła’s father told him that Mary is now also his mother. It is a great symbol of your nation. In the 80’s when I was a teenager, John Paul II came to the USA. He was 90 minutes away from where I lived and my family went to see him and listen to him. For many Catholics his visit was almost like a visit of Jesus Christ himself. John Paul II was the first Pope who has visited the USA [in fact, it was Paul VI - ed. Ł.A.] and met the President in the White House. I didn’t go to see him. I didn’t think it was important. The lightning strike came years later. We will talk about the lightning strike later. You didn’t go to see the Pope but years later you caught up for it. You met John Paul II during the audience after playing Jesus in „The Passion of the Christ”. After watching the film he said „It is as it was”. How did you receive the praise coming from the Pope? „Tak było”! [Caviezel says these words in Polish imitating Wojtyła - ed. Ł.A.]. The Pope always called young people to break away from contaminated and demoralised civilisation. „Be saint” - he said. Impossible? It is doable. I often hear the voice of the Christ in my heart: Jim, you will manage today. It is a message saying that everyone in the world is equally important. It is also an appeal for a Christian life. Life in which one demonstrates to everyone they come across that Jesus is their Lord. I remember the Pope saying to Americans: „You can all be saint!”. It makes me sad that so many people in my country do not seek sainthood. They substitute it with drugs and hedonism. It is simply filling the emotional void. What did you tell the Pope during your audience in the Vatican? I told him how much his letter to artists influenced me. It was aimed at those who look for the beauty and give it to the world in the form of art. I try my best to carry out his instructions. Exactly. This is where his power came from. He understood the people and it helped him to win over hearts of the millions. He is simply saint. Don’t you tell me it was a coincidence! There are no coincidences. I keep on hearing about accident and strokes of luck. Secularisation affects the entire world, also the USA. Only the atheists believe in coincidence. There are no coincidences for God. Even when God resurrects the dead, they will say it happened by an accident. When one doesn’t believe in God, one believed in anything. Gilbert Keith Chesterton claimed that. At the same time one doesn’t have the right to do what they like and decide abut everything. Live without morality? Without goodness? Where is love in all of this? It’s even more visible in Europe. The founding fathers of America could not imagine it without God. The French Revolution started with killing the priests and spitting on Jesus. But lets go back to Hollywood and your work. „You will not work here anymore” - Mel Gibson told you when you took up the role in his film. To what extent was he right? All of the sudden I stopped being one of five most popular actors in the studio and I haven’t done anything wrong. I just played Jesus. Was I personally touched by this rejection? Well, everyone has their cross to bear. The world changes in the particular direction but after all, I will not be in this world forever. Neither will the producers from Hollywood. At some point, everyone will have to answer for what they have done. Where do you think this reaction come from? Are people afraid of such films? Of evocative picture of Jesus on the screen? People really stood for it. Over half a milliard dollars income is a great success. There are even reports on conversions after watching the film! It isn’t me who should answer this question. They should, shouldn’t they? I did my job. The film has inspired millions of viewers. Let the producers answer whether they are afraid of this success. My career is not over. After all, I starred in some prominent, Hollywood films. I also played in a popular TV series called „Person of Interest”. At the same time, I’ve never forgotten that the name of Jesus is above all else. It is also the most controversial name of all times. Love is controversial and he impersonates love. Jesus was telling the Romans about love and they killed him because of that. „Who is that man to tell me what kind of person I’m supposed to be?” - they asked arrogantly. He was betrayed by his own people and abandoned by everyone. My duty was not only to show it all on the screen. My real duty is to live in accordance with the gospel every day and to give witness to the truth. And it all goes down to John Paul II again. „Totus Tuus” - „Totally Yours”. If you want to know how he inspires me, this is it. Totally Yours. This is the essence of my faith. My relationship with Jesus is thanks to her. She brought Jesus to us. My friend who is an evangelic asked me once why I don’t reach out to Jesus directly but I follow Mary instead. I think it’s a valuable question. Back then I didn’t know how to respond to him. However, looking at John Paul II I found the answer. That’s why Poland like no other country is tied closely to Jesus. You bond East and West together. Devil hates it, although he has already lost. Jesus and Mary have already crushed him. A single Polish crushed the communism. How did John Paul II achieved this? With love. In my opinion we weren’t stuck behind the iron curtain for no reason. Maybe it was the plan of God that we don’t understand yet. Poland wasn’t affected by the events of 1968, unlike the USA and the West. We didn’t adopt moral relativism, nihilism and hedonism. Therefore, the counterrevolution, evangelisation of the western world may actually start in Poland. An atheist would say it’s a coincidence! You’re right, it’s the plan of God. My country was blessed, it was said to be like heaven. In spite of that, people are loosing faith. They aboandon Jesus. It hasn’t happened since Moses. 40 days in the desert happened for a reason. For me, the catholic mass is the source of constant empowerment. That’s where I can meet Jesus. And it’s not simply about having the symbolic wafer. It’s about an actual transformation. Bread and wine? No, it’s the body and blood of the Christ. This is worth dying for. Every day I pray to die with Jesus in my heart, not to ever abandon him. Now I would like to talk about the lightning that stroke you during filming „The Passion of the Christ”. Was is the scene of crucifixion? It wasn’t crucifixion. We filmed in Rome. It was the scene of the Sermon on the Mount. I climbed the mountain, clouds had formed and 5 seconds before the stroke I had felt what was going to happen. It was windy but I couldn’t hear the wind blowing. Suddenly, I was stroked by the lightning. I was terrified but at the same time I felt peace on the inside. Before it all happened, Mel had shouted „action” and the cameras were directed at me. It was the moment I was stroked. Afterwards I heard Mel shouting: „What the hell has happened to his hair?”. It was funny. People think I’m gloomy and serious. That’s not true. Polish nun has come up to me today and asked: „Why aren’t you smiling?”. I told her that I was smiling with my eyes but the signal hadn’t reached the rest of the face yet [laughter]. It’s the first time I see you smiling! I’ll note that in the interview. You are one of very few devoted catholics in Hollywood. Is is tough? People in Hollywood keep asking me why can’t I separate my acting career from being a catholic. Actually my faith helps me. When I played basketball it motivated me. It’s the same now. I’m aware of the fact that I’m lazy but that’s the reson I work so hard to overcome my weakness. My faith helps me to make the right choices, even though many people who inspired me didn’t have faith. Mel Gibson struggles with his faith too. However, it was him to invest his own money into making „The Passion of the Christ”, and not hundreds of other, wealthy catholics. In 1998, you played in the flamboyant Terrence Malick’s masterpiece „The Thin Red Line”. In my opinion he is one of the biggest metaphysicians of the contemporary cinematography. It looks like before „The Passion of the Christ” your faith and career didn’t go together. Malick is a genius. He’s very spiritual himself and he makes beautiful, poetic and metaphysical films carrying the universal message. Therefore, he can reach further. In my opinion if John Paul II was a director, he would be just like Malik. He penetrates the very recesses of the soul and leave the viewers with question which can lead them to God. So many people nowadays are prejudiced against christianity that they wouldn’t watch Malick’s films if they were so straight forward and labelled the „christian movie”. Mel Gibson saw me in his film and even though he wanted the cast of”The Passion of the Christ” to be entirely from outside of the USA, he decided that guy, Jim Caviezel, may be suitable for the role of Jesus. Malick and Gibson are very much alike. They both can interest viewers who are so far away from religion. Gibson has returned after 10 years of exile from Hollywood with his magnificent, Christian film the „Hacksaw Ridge”. Will the continuation of „The Passion of the Christ” come next? I played various roles in my career. I once played a serial killer and I had to look into his soul. I had to ask myself whether I would be able to kill another person. I played soldiers and sport people. I also played in the screen adaptation of the „Count of Monte Cristo”. Lately I starred in a western film inspired by John Ford’s classics. The role of Jesus was the most difficult endeavour I’ve ever taken up. There is nothing more glorious and at the same time more humbling than this role. Nothing could teach me the humility better. The thought of doing it again feels like a nightmare. However, when I come to a country like Poland and see the places of martyrdom and sacrifice, I come to realise that only love can save the world. The love of the Christ. Therefore, I want to work with Gibson again. This time it will be a film about the resurrection. If „The Passion of the Christ” inspired so many people to do good, why don’t we try again? I feel like there is a purpose in my life again. That’s why I’ve played in a TV series about a man looking for a purpose for the last five years. I don’t do it just for the money. I do it for the love. It’s my christian mission. Isn’t it what John Pail II did? He inspired people. He was telling them about the truth and love but not in a banal way. The part of his pontificate and its final was full of suffering. When I played Jesus I prayed a lot. I asked God to show me how I can present Jesus in the most accurate way. How to make the viewers feel closer to him. How to inspire the viewers. It has been my inner journey which as we can be hasn’t finished yet. While working on „The Passion of the Christ” Mel reserved the right to stop filming anytime. He needed to be 100% ready in a spiritual sense. This story could only be told with absolute involvement. Totus Tuus. I wouldn’t manage to finish this project either if it wasn’t for the Virgin Mary. I’m absolutely devoted to her, just like Poland. They all were abandoned and unwanted. Two of them had brain cancer. The third one had sarcoma. My wife said it doesn’t matter whether children are wanted or not. They are people, just like we. That’s another lesson of John Paul II about the civilisation of death. I wouldn’t do that without my wife. She impersonates beauty and kindness. She prays for me not to leave the right path. Jesus said that whatever we do the smallest of us, we do to him. He wants to be in us, in all the simplest actions. I’ve just remembered that long ago you rejected a role in „X-Men”. If you had taken it back then, you would have probably play in „The Avengers” today and be adored by the teenagers. Instead, a few years later you played the biggest superhero of the humanity. Do you think it was a coincidence as well? What is the most beautiful aspect of „The Passion of the Christ” is that everyone is focused while watching this film - conservatives and liberals, atheists and religious people. They watch it in silence and hear: „Ehjeh aszer Ehjeh”: „I am who I am”.